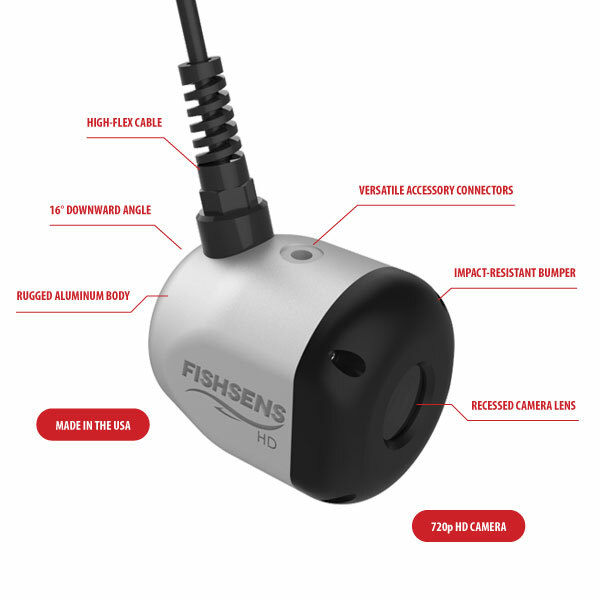 Absolutely the most robust underwater fishing and fishery research cameras on the market, SondeCAM HD and SondeCAM WQ offer high definition video and are designed to offer years of service in extreme marine conditions. Both cameras are protected by a marine-grade, anodized aluminum body with an abrasion-resistant polyurethane jacket and a high-flex cable design including flex fittings at each end to reduce strain and vibration, and to extend cable life. SondeCAM HD video is displayed on popular fish finders and streamed via WiFi to mobile phones. The video is recorded and shared with easy-to-use iOS and Android Apps. The camera is compact and lightweight, although heavy enough to sink in most applications. Optional sinking weights are available for high flow applications. It is easy to deploy, retrieve and store. Inside the extreme duty, housing is a Sony IMX222 imaging sensor selected specifically for underwater applications. The low lux underwater camera offers high-quality visuals in limited light applications. While used by freshwater and saltwater anglers worldwide, the camera is also a research grade tool. Many fishery researchers and scientist regularly deploy SondeCAM HD to aid in habitat assessment, species identification, and reef monitoring. SondeCAM WQ can be deployed above or below the surface and is designed to be the central hub for a fishery research monitoring station. The SondeCAM WQ platform is extremely versatile with a microprocessor-based controller and an embedded Linux operating system. Adding to the versatility are a series of accessories, including lights, self-cleaning wipers, motion sensors, and water quality sensors. All data, still images and video clips are saved to a removable USB flash drive that is securely housed inside a watertight port. Both time-lapse and event-driven video modes are available or can be combined. Battery power is supplied with an external rechargeable pack and a series of bottom platforms and bait remote underwater video packages are available.